A proposal to move Belfast City Marathon to a Sunday is set to be discussed at Belfast City Council meeting on Wednesday afternoon. For the last 36 years the marathon has been traditionally held on the May Day bank holiday Monday. Previous proposals to move the day were rejected. However representatives from some churches on the route have said moving the event to another day could be disruptive to their congregations. 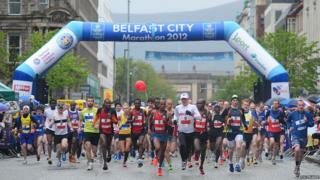 The 'Belfast City Marathon 2019 and Onwards' report will go before the City Growth and Regeneration Committee. As well as seeking to change the day of the event to Sunday, a new course is being proposed from 2019. The report states that the stakeholders and the various churches "directly and indirectly affected by the proposed new courses" will be consulted. Rev Kevin Graham from St Bartholomew's Church in Stranmillis, which would be on the proposed new marathon route, has mixed views on the matter. "I don't mind the route passing the church. Previously we had the Giro d'Italia go past and engaged with that, but it was a Friday evening," he said. "The potential to move to a Sunday, we would be conscious of the commandment to keep holy the Sabbath day, but would also bear in mind that Jesus said the Sabbath was made for man and not man for the Sabbath. "So, while it presents difficulties, there are also opportunities in how we can interact with the participants in meeting their needs for liquid refreshment en-route but also for the spectators. "We could provide a space for them to watch". Marathon quiz - test your mettle! Rev Christopher St John from St Mark's Dundela told BBC News NI that he feared it could prove disruptive to some older members of the congregation. "We currently run three services on a Sunday morning and have a lot of elderly parishioners. "It is very important they can make their way readily to the service. "If the marathon was going past, a lot of parishioners would not attend and would be cut off from their friends". However local business owner Les Hume told BBC News NI that he was very much in favour of the idea. "From a Belfast Chamber of Commerce perspective we have encouraged the idea of a move for many years," he said. "Having it on Bank Holiday Monday brings a lot of congestion into the city. "We see a Sunday morning being a much better proposition, allowing more people to come into the city and spend the day there". The new proposed route would see a move away from Dargan Crescent in North Belfast. It would also encompass the Titanic Quarter and include more of south Belfast. Instead of a finish at Ormeau Park, the route would end at the gates of Stormont estate.